This weeks installment of interesting resources that I received via Twitter. If you are not using Twitter yet, you should! 1.) 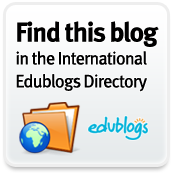 The Encyclopedia of Educational Technology - A publication from San Diego State University. A good list of educational technology that relates to many of the educational theories and practices that we learned while in our teacher education programs. Worth a look. 2.) Google Earth Across the Curriculum. A great resource by Free Technology for Teachers discussing how to use Google Earth in your classroom. Highly recommend taking a look at this resource. Google Earth is more than just a Geography tool, and this helps to show you why. 3.) Langwitches Blog Post - Great post about how to be followed on Twitter and to learn about the types of people that are following you on Twitter. Very useful for those that are new to Twitter. 4.) PDFmyURL - If you are interested in making your website into a PDF file. Useful if you want to be able to send your Blog Post in a PDF format, or have a website with information that sharing in a PDF makes logical sense. 5.) AppMakr - Interesting. You provide your URL and it creates a sample App for the Iphone of what your website would look like. Kind of fun to play with....don't think my blog is worth an App yet though! Maybe your website is...here is a way to create yours. 6.) Dirpy - Take those YouTube videos and turn them into an MP3....I think many of us have been looking for this option. It is a lot easier than sites like Zamzar. 9.) 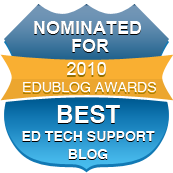 Interesting read...14 Technologies Educators Should Watch for in 2010. My questions is, am I ahead of the times, if in January I am already past watching them, because I am using them??? Or which educators are they talking too? 11.) Museums are always something I have loved visiting. As a teacher, it is tough to know some of the best ones, or even the ones that exist in your own state. Well, here is a list of Museums Online for the United States and the World. 12.) Wordle, Voicethread, and .....Ninitendo DS (yes..in the classroom). Interesting set of presentations from the Edte.ch Blog. Thanks for sharing! Although I'm on twitter, I don't think I'm on it "enough" to get the information. I'm going to try HootSuite to see if it will help me manage my feeds (facebook, twitter, etc), so that I don't have to "stay on twitter" to get what I need. ----I really enjoyed the digital camera read....thanks again. AppMakr is an interesting tool. I've seen a few of these popping up lately. And, I'll use the digital cameras ideas this week. Image Chef is another great Wordle alternative!